Part of a classic 19th century Paris 'stone' building, our 1 bedroom ground floor (first floor US) apartment faces a very quiet garden courtyard. 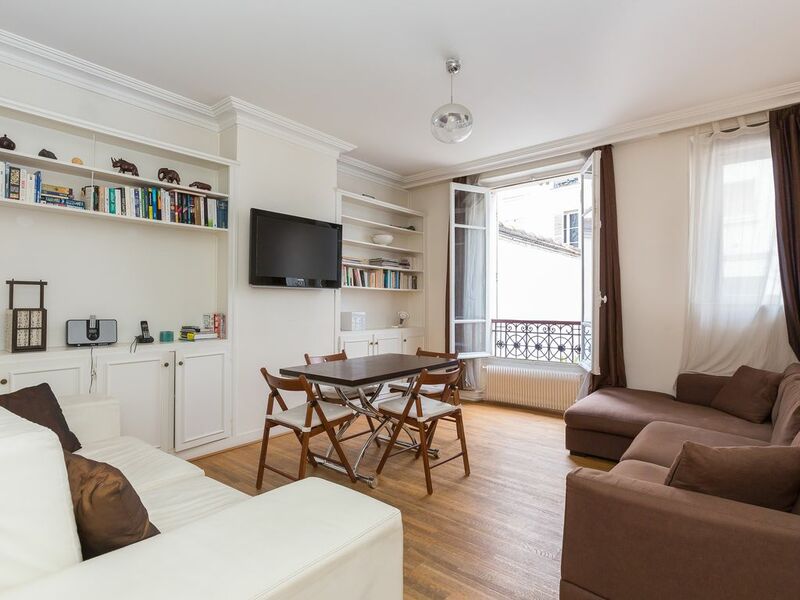 It is very well located in a residential and safe area called 'Le village des Batignolles'. It is a 20 minute walk from Montmartre and Sacré Coeur where you can enjoy one of the most beautiful sights of Paris. You are also 15 minutes on foot from Place Clichy and the most important antiques shop area in Paris 'Les Puces de St Ouen'. Less than 200 meters away, there are 2 wonderful parks with playgrounds for children and a typical French market with many shops (bakery, dairy cheese & other dairy products, butcher, French delicatessen, supermarket, etc) and many restaurants and bars. You will find a 'Velib' city-wide bycicle renting station in front of the apartment, and 2 metro stations and bus stations less than 3 minutes away on foot. You are less than 3 metro stations away from Haussman-St Lazare station (next to Opéra Garnier, Galerie Lafayette, Printemps, and all the famous fashion shops), 7 stations away from the Champs Elysées (15 minutes) and 4 stations away from Parc Monceau (10 minutes). Access from CDG or Orly airports or from Bercy, Gare de Lyon, and Gare du Nord railway stations, is really easy and fast. Close to 45 square meters, the apartment is spacious by Parisian standards. There is a large living room, separate kitchen, a bedroom, and a bathroom. In the living room you have a large sofa (converts into a bed for 2 people), 1 chair (converts into a bed for 1) and dining area for up to 5 people. In the bedroom there is a large King size bed (160cm x 200cm). In the bathroom there is a sophisticated glass-enclosed shower. The kitchen is furnished with the latest, high-efficiency appliances for cooking. 'Le village des Batignolles' reminds me my village in Southern France. It is very safe and quiet. There is no traffic and neighbours are nice and helpful. There is even an outdoor market every week end. What I really like about my apartment is how quiet it is because the building on the other side of the courtyard blocks any street noise. It is located close to Gare Saint Lazare, so basically in the center of the city but the birds wake you up each and every morning ! Benoit's apartment was an excellent choice for our six days in Paris. We were greeted by Alan and found the apartment with no problems. It is set back away from the street, which blocks the everyday noise. It is convenient to the Metro, grocery stores and bakeries. We felt very safe in this area and apartment. There was plenty of room, very comfy and we felt at home. Our only complaint was the neighbors above us, were very loud with a child. This was our first trip to Paris & it couldn't have been better! The location is exactly as advertised - central. Thanks to Alan we had no trouble getting where we wanted to go. He helped us figure out the best & most cost efficient ways to get around. We have a teenager and a 9 year old. The neighborhood was safe - so much so we let our teenager go to the shops around us on her own. The nearby park made for a perfect Saturday of relaxing for mom & dad and making friends for our younger one. We were amazed how truly quiet our apartment was. The space itself was very comfortable. We highly recommend this spot. Alan was great too! We stayed in Benoit's apartment for 10 days in August 2014. The apartment was clean, spacious and a perfect place for our family. Arrangements with Alain were easy and exactly as promised. Metro, restaurants, boulangerie and grocery stores were all easily accessible. Parc Monceau is very close and great for runners. We always felt safe and the neighbourhood was very inviting. I wouldn't hesitate to stay here again with my family or with friends. My family and I had an excellent time at Benoit's apartment for our ten nights in Paris. The apartment is large and had everything we needed. It is quiet, but within a vibrant and interesting neighbourhood. Alan was a great host, and met us and showed us everything we needed to know about the apartment and the neighbourhood. He also answered all my questions prior to our trip, and made helpful suggestions. We had a wonderful trip and would definitely stay in the apartment again. We stayed at this fabulous apartment for New Year and we cannot recommend it highly enough. We stayed with three children, one being a small baby and everything we needed was provided. The bigger children had plenty of space and all the technology they needed to be entertained and we were easily able to provide everything we needed for our small baby. It was clean, modern and beautifully equipped. The area was amazing and kept us all entertained. The kitchen and bathroom were to a very high standard. My little 8 year old daughter found the shower amazing!! We would definitely return. We arrived half an hour late, but were greeted with Amina, who gave us a lovely friendly welcome which was much needed after a long journey with small children! I cannot fault both the service when booking and the apartment itself. Very quiet too, set back from the street. Ideal when you have small children or want to sleep in after a fun New Years Eve! The Batignolles area of Paris in the 17th arrondissement is an ideal location for those who want to get a real feel for what a comfortable, multi-ethnic, economically diverse Parisian neighborhood is like. There are trendy bars, cafes, and restaurants that pair well with very local sites like the Square de Batignolles, a local park that is landscaped like and English garden, and the indoor Batignolles market. For those who enjoy the healthier aspects of an organic lifestyle ("bio"), there is a vegan lunch spot in this indoor market, and on Saturdays, Paris's original organic market is on boulevard a mere 7 minute walk away. The apartment is ideally situated in this neighborhood and is a great place to come back too. There is a separate bedroom with a real queen size bed (none of this two single beds smashed together), a small yet functional kithen, and a spacious living room area with everything you need to kick back and relax. You can even turn this living room space into a hybrid "working office" when necessary, which I did. The place stays warm when the weather gets cold outside and you can easily wash clothes in the small washing machine in the bathroom and dry your clothes in the laundry located in the building next door. Overall, a very relaxing visit and I will hopefully get to stay here again next year. Above rates are 2-person (1 bed) rates. Higher rates apply for 3/4 persons (2 beds). Standard working hours from 10am to 8pm. Additional 30 euros charge for late eveing check-in (up to 11pm). After 11 pm, only if prior arrangements have been made.